There are subtle distinctions between "focused", "obsessed" and "bat-feces crazy". I shall let the dear reader decide where I might fall on this particular continuum. I've been intrigued with sandhill crane hunting for a number of years. (My wife would frame this as being obsessed with them). Thoughts usually jumped into my head about chasing them after a wonderful morning in the woods during deer season. It is not uncommon to see several groups of cranes on various fields on the way home. More than once I thought about stopping at a local farm house and inquiring about the possibility but the timing was never right (or I was covered in mud or blood and would NOT make a good first impression). Occasionally I'd see them on the "prairie" at our hunting lease. The "prairie" is a generally open gigantic field with a few trees in areas but mainly grazing lands for cattle. 2015 was the year I finally proactively got in gear to get ready for sandhill crane hunting versus just thinking about it. 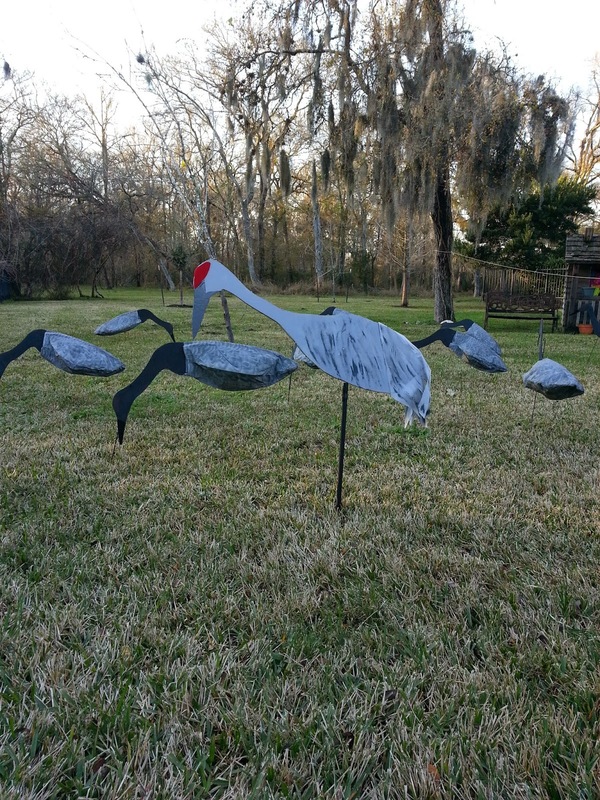 I had most of the needed gear: shotgun, brain, camo, 3" BB goose loads, ... but from everything I've read and people I've talked to, I decided I needed some crane decoys too. 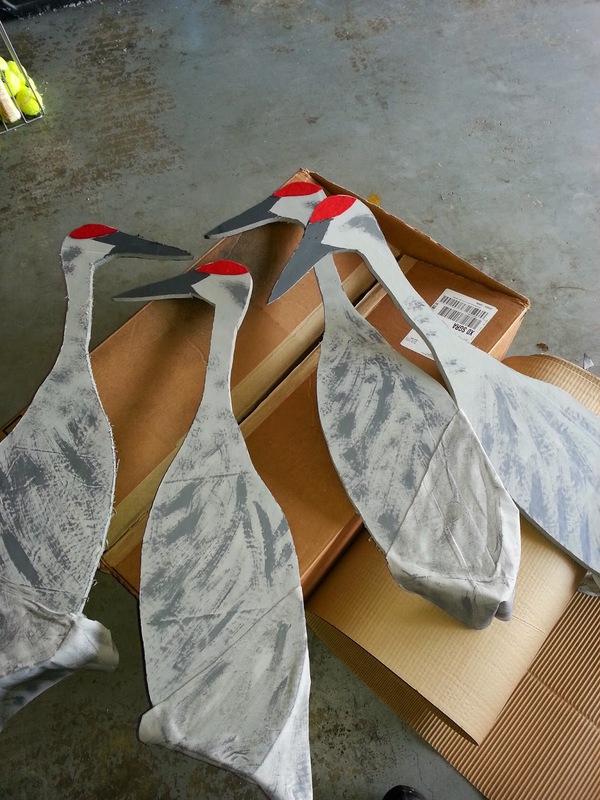 There are some cool looking crane decoys from SilloSock. I acquired a set but was disappointed since they (i) were expensive, (ii) looked like geese and (iii) were the lazy way out. Plus, I only had 12. 12 decoys on a 1,000+ acre prairie seemed a little sparse. Plus, where is the sense of accomplishment and pride in "doing" by just buying some decoys? Anyone with a credit card can do that! I was fine with a silhouette. From a distance, they should look convincing and would be easier to make and store. 1-2 yards of cheap, NON-REFLECTIVE cotton fabric. Take some crane pics with you to match the color the best you can. WARNING: Cranes have excellent eyesight. (Their eyes are larger than their brain if that gives you an idea how well they see.) Avoid anything on your decoys or on your person that is shiny. Many people, when hunting them, immediately pick up spent shotgun shells for this reason. Below are the steps I followed along with suggestions as to what I'd change next time around. Study about 300+ crane pictures. Study their postures, coloration, etc. while naturally standing in fields. Study pics of hunters holding dead cranes to get a feel for the size. 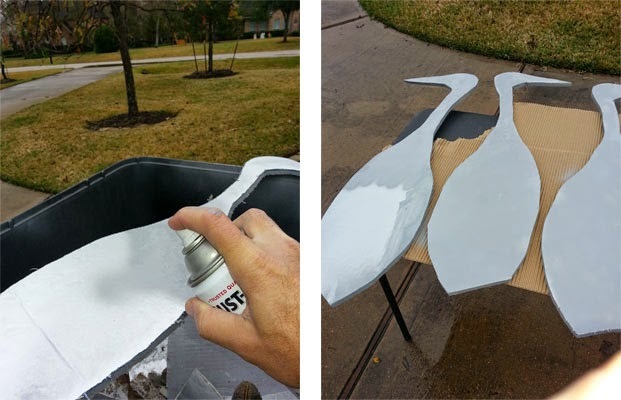 Draw a crane template and tweak until you are happy. This will be used to make all decoys. It does not need to be perfect, just enough to get a crane within about 40 yards. I made 10 copies of the same decoy so they would stack and store easily. 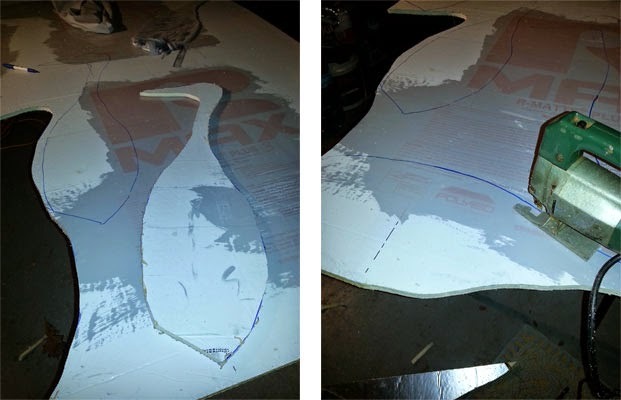 Layout 10-12 decoys on foam board. Cut out your decoy silhouettes. For the first few, I used a jig saw. After giving myself the first reported clinical case of "foam lung", I switched to a really sharp utility knife with a long blade that I used like a handsaw. Be careful, go slow. Make a cardboard template for the "skirt". Cranes fold their wings along their sides. The wingtip feathers form a black "tail" that moves a bit in the breeze and adds to the realism. Glue the skirts on with the spray adhesive. "Feathers" will be cut with a pair of scissors later. Study the pictures some more and make a red felt "template for the red patch of skin on their heads. I made mine too big and too bright but they seem to work OK. 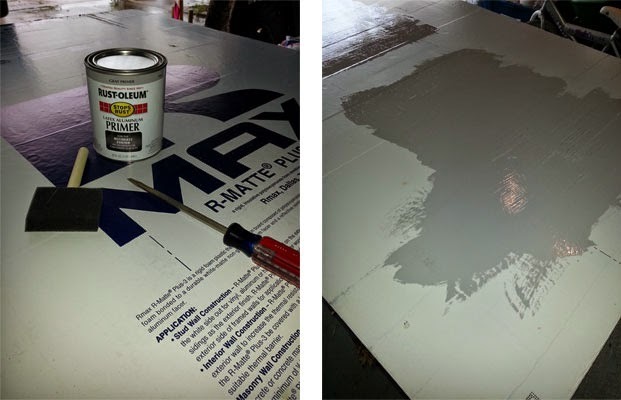 Mix up some dark grey paint. 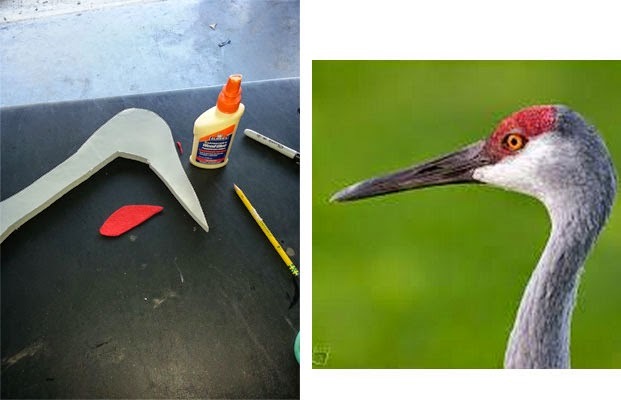 Paint the beaks (which I made too thick because I was afraid they would break) and, after studying the pictures again, some long looking feathers. The final product should look something like the following. 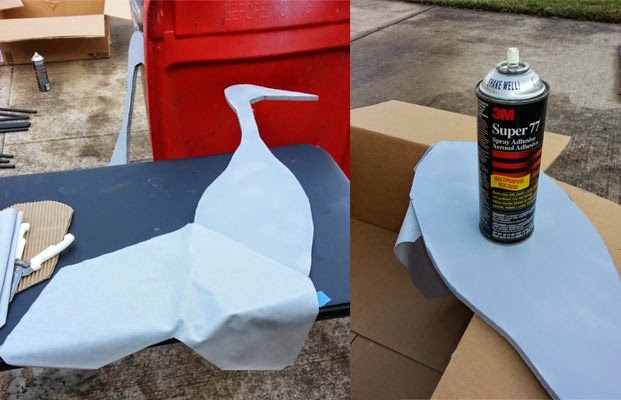 After the paint dries, cut some feather "strips" out of the tail and touch up with dark grey paint. 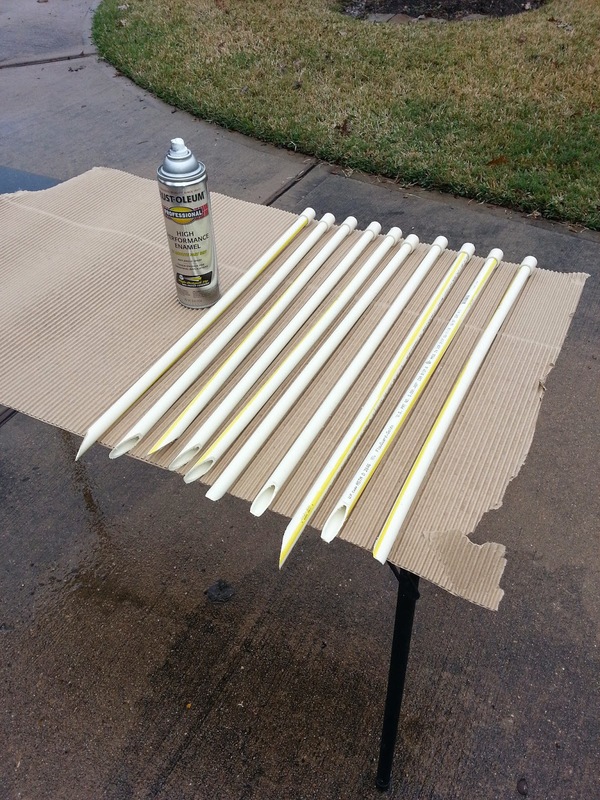 Paint these flat black and after dry, double tape a 6-8" piece of coat hanger wire. Step 11: Admire your handiwork! 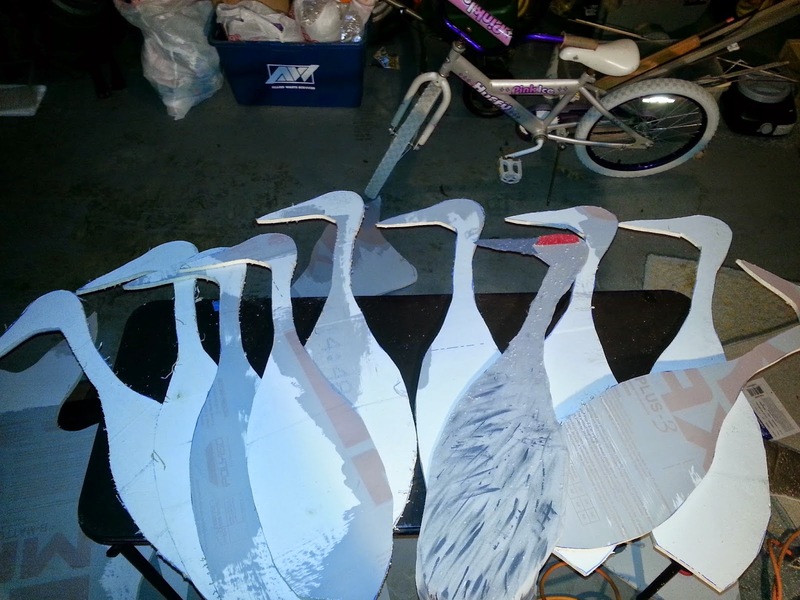 Below are the SilloSocks decoys and my first homemade crane decoy. To my eye, the SilloSock crane decoys look too dark. Mine might be too light. I was able to convince my buddy Kevin to go with me to chase cranes. 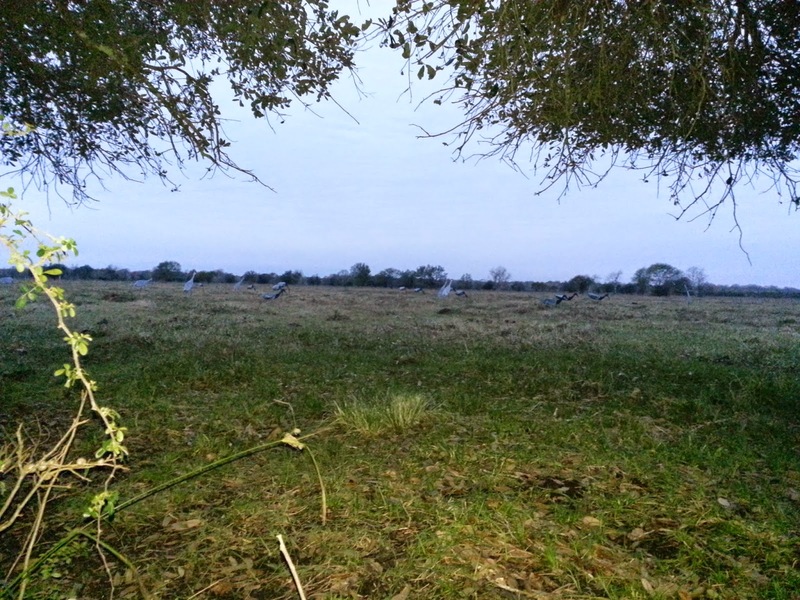 We set up under a large live oak tree where I'd seen crane numerous times with the decoys about 30-40 yards out. The "plan" was to have the birds land into our spread into the wind. Below is our view for the next few hours. The problem is, the oak canopy provided excellent cover but also hid the cranes that showed up. They would look at our spread but not commit to landing. We were able to take a few pass shots that were too long. ALL of the cranes in the area landed about 200-300 yards away near NO COVER. On the ride home, we strategized for the next attempt. We needed to get a call. Calling with you voice did not seem convincing. Once cranes landed nearby, they would loudly and wildly call to other cranes in the air. The airborne birds would fly directly over to the calling cranes after giving our decoy spread a minor look. We had to find a way to hide in the open. ALL cranes we saw that landed were not near any over. This only makes sense. Unlike ducks which can use water to their advantage, cranes are always near something (hunters, coyotes, dogs, cats, ...) looking to jump and eat them. The problem is, the field in which we were hunting is flat with some brush sticking up 6" every so often. We discussed everything from blankets to ghihillie suites to digging a small trench. Related to the above, dark camo sticks out like a sore thumb on a light colored, grassy prairie. Bunch your decoys. Cranes will really bunch up once they find a place to their liking. After a few hours, there were two places on the prairie with at least 200 cranes each with a few pairs elsewhere. Perhaps we had spread our decoys out too much. The next outing (blog pending) was successful with two cranes killed! Of course, this then required more modifications to the cranes (which generally needed to be darker).